Plus, openings by new Poke restaurant, wine cellar and brewery. Will Amazon soon be delivering the pizza you order? While the Amazon Prime service offers free two-day delivery of the many products it sells, according to Amazon “Prime Now offers household items and essentials you need every day plus the best of Amazon, with free two-hour delivery.” And that two-hour delivery now includes restaurant delivery, which may soon be offered in Milwaukee. 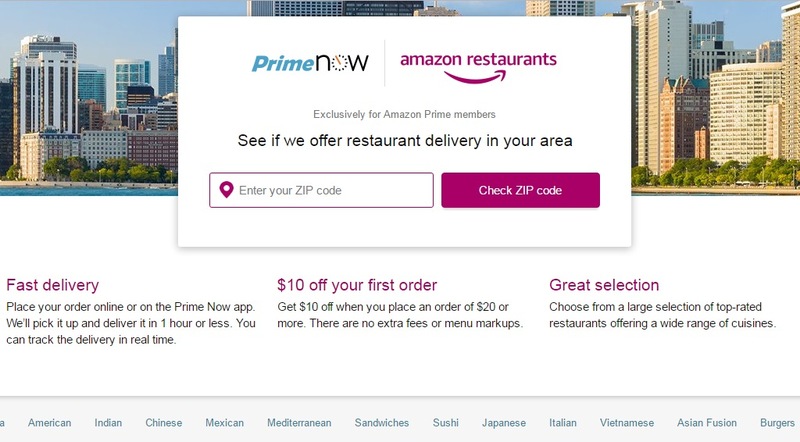 The service, as the Amazon Prime website explains, is simple: you enter your zip code, browse “a curated selection” of restaurants in your area, order the food you want from a restaurant and then Amazon delivers the food. Amazon’s restaurant delivery is currently available in parts of Manhattan, Brooklyn, Seattle, Dallas, San Francisco, San Jose, Oakland, Los Angeles and Orange County, Chicago, San Diego, Austin, Atlanta, Houston, Miami, Baltimore, Minneapolis, Tampa, Orlando, Northern Virginia, Phoenix, Columbus and Portland. Restaurants orders are delivered within one hour of being placed. Is Milwaukee next? A permit filed with the city shows Prime Now LLC applying for a food dealer license for 4111 W. Mitchell St., a warehouse building in the Stadium Business Park. The company previously leased 49,200 square-feet of space in two buildings in the Stadium Business Park in early 2016. Amazon began offering its same-day delivery using the Milwaukee warehouse in April 2016. How long until a drone drops your order at your front door? Not long if CEO Jeff Bezos has his way, the company has secured a patent to do just that. FreshFin Poké offers signature bowls on its menu or completely customizable bowls to include fresh vegetables and your choice of Tuna, Salmon, Shrimp, Chicken or Tofu plus the option of fresh add-in ingredients and house made sauces. The menu also includes great vegan and vegetarian options as well. The Walker’s Point restaurant, Hotel Madrid, opened a new wine-tasting cellar last Thursday in its lower level. La Cava, the underground area offering private wine tastings and dinners, boasts an extensive selection of wines, offering over 300 wines on site. La Cava will host wine tastings with food pairings on the third Thursday of every month at 6:30 p.m. with varying prices depending on the wines selected. You can also become a monthly member of Bin 600 at Hotel Madrid, which will allow you to enjoy a monthly bottle selection, concierge wine purchasing, private member dinners, priority booking for events, and locker space for your wine collection, as well as exclusive access to special wines in the cellar. More information on La Cava events and membership can be found at their website: http://www.hotelmadridmke.com/cave. Inside, the building stretches the blend of modern and contemporary design. What looks like subway tiles are really the original brick work, which was hand-glazed by Tiffany in Chicago. The soaring ceilings, once painted black, have been shined to a natural wood color. Reclaimed wood — practically a requisite for any new brewery — forms a patchwork on the walls of the taproom. From the bar, patrons can look at the 30-barrel brewhouse through a glass window and sliding glass barn doors that flank either side. Look closely: A crane from 1899 left in the building has been repurposed to hold the milled grain in place in the brewhouse. Shorewood’s new ice cream and burger joint, The Ruckus, had, well, quite a ruckus last week. They were so busy opening week that they have officially cut back their working hours until further notice.